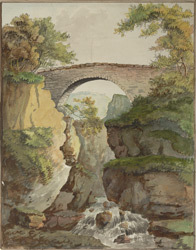 View of a bridge over a waterfall at Lydford in Devon. By the late 18th century Lydford was a small village on the banks of the river Lyd. However it had previously been a significant town - with its own market charter, two castles and a centre of stannary (tin-mining) law. It was part of the Duchy of Cornwall. White's Devonshire Directory of 1850 comments 'Lidford Bridge crosses, by a single arch of only a few feet span, over a dark and apparently interminable chasm, under which the river Lyd is heard falling 50 or 60 feet beneath'.